Many years ago we abandoned the idea of being able to own our own woodland as there is so little of it in West Lancashire in the first place and, of that, it is very rare that it comes up for sale. 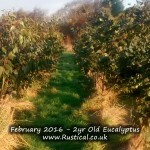 But, rather than admit defeat, we bought some arable land and field by field planted our own energy crop; species that thrived on rotational coppicing. 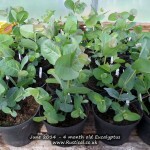 In the first instance this was predominantly ash which we grew on from seeds collected from some fine local specimens. 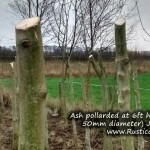 As the dreaded ‘ash dieback’ or Chalara dieback of ash (Hymenoscyphus fraxineus) to give it it’s proper title, gained a foothold in the UK we thought it pretty pointless in planting any more ash and started growing a wider mix of species such as willow, alder and sycamore. We also trialled a few eucalyptus varieties (from seed) to see how they compared to the vigorous growth of the hybrid willows. 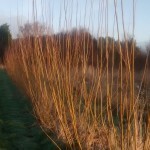 Many claims about the fast growth of hybrid willow exist on the internet and we really wanted to test them out for ourselves. 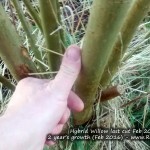 Having grown some willow stools as breeding stock for new cuttings we knocked them back and vowed to document the progress each year up until they made useable logs. I will keep this post updated annually with progress.